RESIKON SP-130 is a chloride free high range water reducer based on lignosulphonate for concrete and cement mortar. It improves workability and minimises water requirement, segregation and permeability. RESIKON SP-130 disperses immediately in water and when added to concrete mixes permits water in the mix to work more effectively by helping cement particles disperse. Due to the exposure of larger surface area the hydration reaction then progresses more efficiently with limited water. This results in improving workability and attaining strength with less cement content in the concrete. Concrete with reduced water / cement ratio with some workability. RESIKON SP-130 should be added to the required water before mixing it with concrete dry mix. It is exceptionally suitable where:Increased workability without reduction in strength is desired. Improvement in strength with increase in workability is needed. Reduction in cement in the concrete with gain in workability and strength is needed. 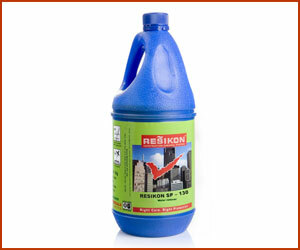 RESIKON SP-130 can be used in the range of 150-250 ml per bag of cement. Actual requirement of RESIKON SP-130 should be ascertained at site by conducting trials with the materials to be used. RESIKON SP – 130 can be used in the range 0f 100 – 500 ml per bag of cement of 50 kg depending upon thedesired workability. Its addition should be done along with the final water addition. It is recommended to have site trials in the prevailing atmospheric conditions to determine the optimum dosage. Over dosage would increase the workability at the expense of reduced setting time, however, final concrete strength would not change. Health hazard : Though RESIKON SP - 130 is non-toxic, it is recommended to take necessary precautions which one would take while handling any chemical. Direct contact with eyes should be avoided. If it splashes into eyes, it should be immediately washed out with water. If needed consult a physician.